SO WITH A HUGE RANGE OF DIFFERENT CHOICES ON THE MARKET FOR PORTABLE FRIDGES!! HOW ON EARTH DO YOU CHOOSE THE RIGHT ONE FOR YOUR NEEDS?? 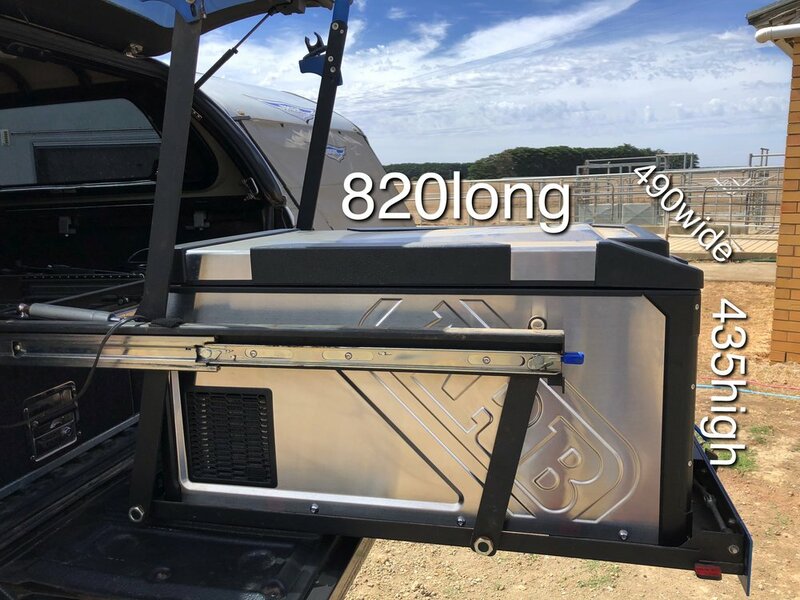 Let's take a look at the new ARB ELEMENTS FRIDGE, it's got some great features that might make it a great choice for your adventures! We'll start with the dimensions so you know if it will fit in your rig or not? The External dimensions are 820 x 490 x 435 (length x width x height in mm). It fits comfortably in our MSA DS60 drop slide and you have 2 choices of mounting which is a cool feature. 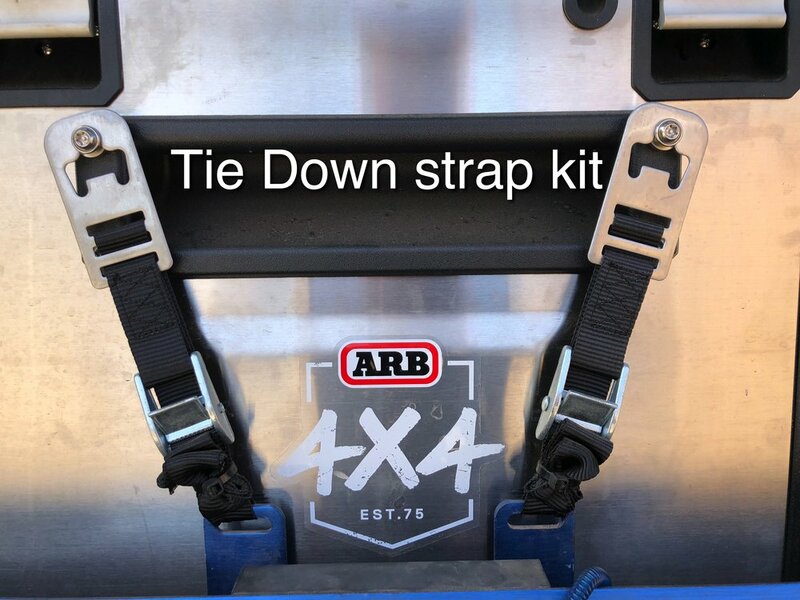 You can either use the ARB fridge tie down kit that involves fitting a few brackets to the case of the fridge, or you can bolt the fridge to your slide with the integrated threaded boss mounts in the base of the fridge. LETS GET TECHNICAL, but only what you really need to know!! After owning other brands of fridges, we have really appreciated the thought that's gone into the design of the new ELEMENTS fridge. Now some of these features may seem really simple, but i can tell ya it makes a real difference when you are living out of the fridge for long periods of time. It just makes life that much easier AND WE ALL WANT THAT!! BIG BUCKLES to grab for opening and closing the lid! 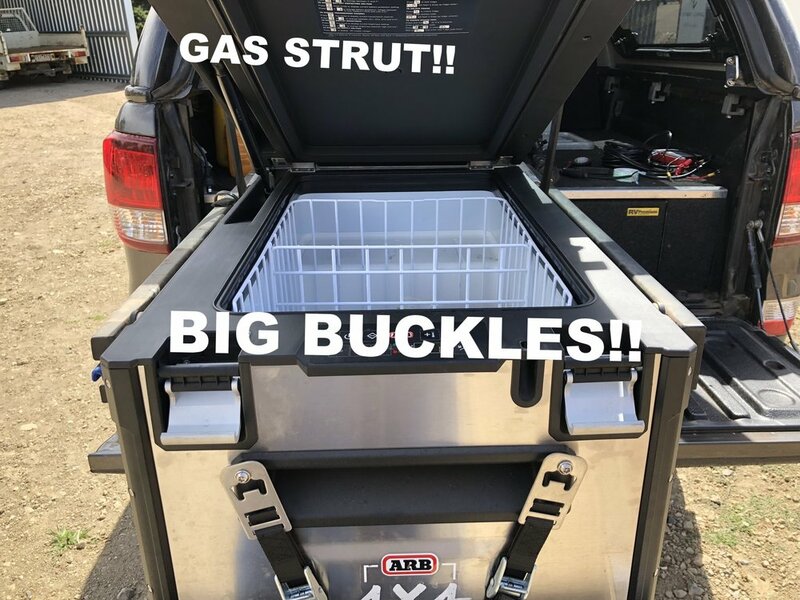 A gas strut fitted to the lid that aids in opening and also holds the lid open while your rustling around searching for something. An internal LED light that is awesome for finding things in your fridge at night time. An integrated drain bung in the bottom of the fridge means no more unstrapping your fridge and tipping it upside down to defrost or clean up spills. An easy to use Dash panel that gives you info about your fridge and your battery system status. A cool passcode lock that stops sneaky mates stealing your beers and also a place to use a padlock for security. 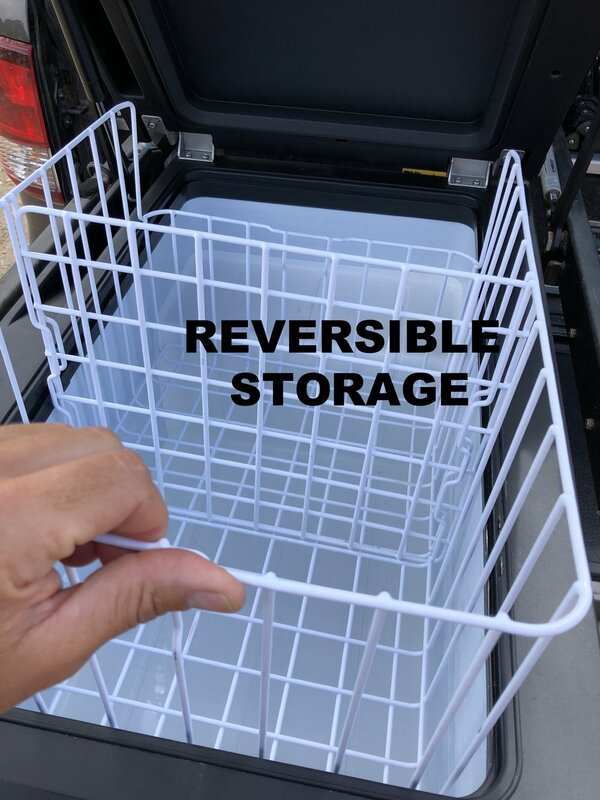 A removable and reversible storage basket that lets you store heaps of different products in the fridge. Especially bottles of wine for the Mrs. SO THAT'S THE NEW ARB ELEMENTS FRIDGE IN A NUTSHELL! IT'S TOUGH, IT'S STYLISH, IT'S GREAT TO USE AND IT SUITS OUR TOURING LIFESTYLE! CAN'T ASK FOR MUCH MORE THAN THAT HEY!! CHEERS EVERYONE - ANY QUESTIONS FOR US YOU CAN SEND THEM THROUGH ON OUR SOCIAL PAGES OR WEBSITE LINKS BELOW.